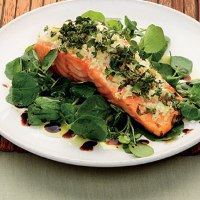 Fresh ginger and salmon are a great match, and make a super-healthy meal when paired with a leafy green vegetable such as watercress. Put two fillets of fresh, boneless salmon on a piece of foil and sprinkle evenly with 1 tbsp chopped ginger and 1 finely chopped clove of garlic. Squeeze the juice of half a lemon over both pieces of fish then sprinkle with chopped coriander. Wrap loosely in the foil and bake for 13-15 minutes, or until the fish is cooked through. Serve with watercress, dressed with a drizzle of olive oil and balsamic vinegar.